2nd Lt Carl "Dusty" Roads began his service with the 492nd during the Col Pierce command in 1943. We assume that he already had a crew when he came into the Group and had a couple of personnel changes during training at Alamogordo. Two of his men came from the Loose Crew and another from the Earleywine crew. See the Training links. 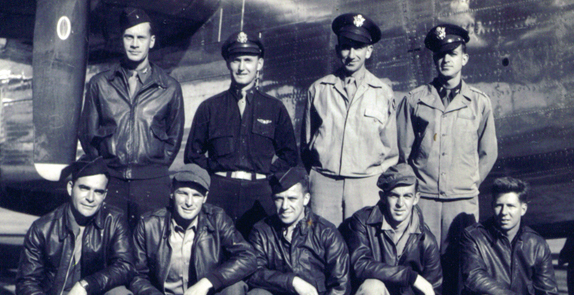 His crew was assigned to the 859th BS, designated as Crew 915. Lt Roads signed out for a B-24, 44-40153. To our knowledge, they didn't give thier plane a nickname. In April of '44 they flew their assigned ship to England via the southern route. Lt Green, the Squadron Assistant Operations Officer, went with them as acting co-pilot. The Crew's co-pilot, F/O Higgins, went on the Queen Elizabeth to supervise the personnel of the 859th. Lt Alexander, the Squadron Bombardier Officer, also tagged along. Neither roster for the flyover or the Queen Elizabeth list Sgt Devine. We don't know how he got to England. The assumption would be that he took the boat. By our count Lt Roads served as aircraft commander for Crew 915 on 13 missions. Other records say 11, but we aren't finished researching yet. We haven't confirmed who was on each of the missions, as substitutions are possible as well as the bombardier missing some of the Pathfinder-led missions. At some point Lieth was replaced by Becker. The Roads Crew was shot down three times. The first time was on 13 May 44. They weren't actually shot down, but damaged such that they couldn't land. They had to crashland their plane when they returned. The second time (date being researched) they took a hit in their left wing fuel tank and had to make an emergency landing at a British fighter base near Dover. They had to leave their craft there as the runway was too short to take off. The third time was fatal. On 18 Jun 44, they were hit by Me-109s while attacking an airfield near Luneburg. The Germans added insult to injury by hitting them again by flak as they were limping back to England. They got within 12 miles of the English coast when they were forced to bail out. Their ship exploded when it hit the water. The British Air-Sea Rescue responded quickly, but could only save two men and recover the body of a third. 8 KIA, 2 RTD, MACR 8235.